Enjoy the 21 - BlackJack! Form 21 Group Demo from Scott Richman on Vimeo. 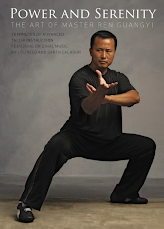 MASTER REN GUANGYI (Kung Fu Magazine's 2011 Hall of Fame "Instructor of the Year") is one of the foremost practitioners of traditional Tai Chi Chuan. Our new DVD is now available with all new features, menus and music -- Power and Serenity - The Art of Master Ren GuangYi -- Featuring over 70 minutes of new detailed instruction and demonstrations...including 6 new original compositions/tracks by poet, photographer, student and rock legend - Lou Reed. On this DVD, Master Ren provides special instruction and demonstrations of both Silk Reeling and the 19 Form. Directed by Emmy and NAACP Image award winning producer Scott Richman, Power and Serenity - The Art of Master Ren GuangYi - features the 19 Form and Silk Reeling exercises which were created by Master Chen XiaoWang -- Master Ren GuangYi's teacher, at the request of the Chinese government in order to make Chen Tai Chi available to the modern practitioner. Both practices are shorter and require less time and space than before. Both practices contain elements from more advanced systems so they remain challenging. For the contemporary student with constraints of space and time these are perfect solutions. This is the original Tai Chi constantly evolving through it's lifeblood to reach and teach you internal power — the meditation of physical movement.